Defensive Driving Oklahoma | No Better Way to Save! Oklahoma drivers now have the opportunity to complete a defensive driving Oklahoma course for ticket dismissal and insurance savings. To help you get these benefits, we have partnered with the great folks at I Drive Safely to offer you this great online course. Register now and enjoy the freedom and flexibility of their fully approved, 100% online course. Your driving record can be a deciding factor that can dictate anything from auto insurance rates to whether or not you are able to be hired for a potential job. Don’t let a traffic ticket blemish your record and have a negative impact on your future. Keep those points from ever showing up with an I Drive Safely online Oklahoma defensive driving course. 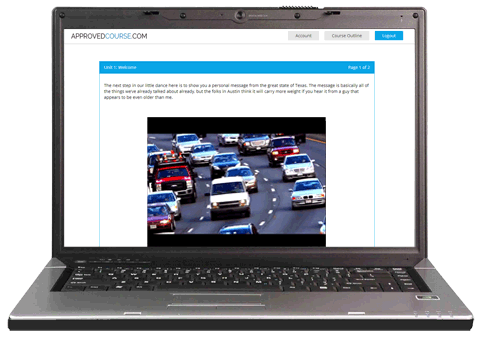 This online defensive driving course provides freedom and flexibility to do just that. Gone are the days when taking a driver safety course meant sitting in crowded classrooms, listening to boring instructors, and a wasting a perfectly good Saturday. Now you can fulfill your course requirements whenever and wherever you choose. Set your own deadlines to meet your requirements with the freedom to tell the classroom goodbye for good. Online puts the course on your time. This Oklahoma defensive driving course is presented entirely online, meaning it is completely flexible to fit your personal learning style. Pace yourself the way that suits you best according to the way you learn best. Study better at home? Somewhere quieter? Are you sharper at 2 PM or 2 AM? Online lets you choose. Choose your own pace. Finish all at once or a piece at a time. Log in and out as often as you like. When you come back, you’ll start right where you left off, no matter if you log on from another location or another device. If you learn more efficiently listening than reading, check out the audio version! The course is divided into eight chapters, and each ends with a 10-question quiz to get you prepared for the final exam. The final should pose no problem to you at all. The final is only 20 questions long, all multiple choice. The state does require a passing score of 80%, but if you don’t make it the first time, we let you try, try again until you do. Passing the course is virtually a no-lose proposition! If you’re like most folks, you probably enjoy paying less for the things you need. Taking a defensive driving course may allow you to do exactly that. Many insurance companies offer discounts to their policyholders who have completed a defensive driving course. Call your agent today, and you could be on your way to saving money before you know it. We know that you need that defensive driving Oklahoma certificate of completion as quickly as possible and we’ll not keep you waiting. In fact, if you finish your course by 3 PM CST and we'll drop your certificate in the mail that same day - completely free. We also offer affordable options for expedited delivery if you need it sooner than the US Postal Service can get it to you. That’s not the hollow promise of a late night infomercial, it’s our sincere commitment to be here, should you need us, seven days a week, 365 days a year. Help from one professionally trained customer specialists is just a phone call away. If you enjoy the idea of wasting a Saturday to sit and be bored in roomful of strangers taking a defensive driving course in the traditional classroom way, then our course probably isn't for you. However if, like most people, this doesn't describe you, then online is the better way to go. With an online course you can work on your course any time day or night and from anywhere home or away. Complete your course at your own pace from your own place. No travel to a classroom, no lectures in a classroom, no classroom full of strangers, no wasted Saturday. Click REGISTER to choose the better way.